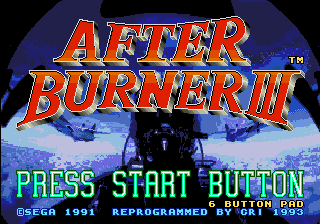 After Burner III (アフターバーナーIII) is an aircraft combat game developed by Sega for the Sega Mega-CD and FM Towns. It is a port of Strike Fighter, which only saw release in Japanese arcades, adding a CD audio soundtrack (with the addition of music from After Burner II) and cinematic sequences. As Strike Fighter was actually a sequel to G-LOC: Air Battle, it does not have a third person perspective view like After Burner and After Burner II. After Burner III adds this view as an option. Main article: After Burner III/Magazine articles. Main article: After Burner III/Promotional material.